In Foot Trails last 15 years we’ve seen a huge shift in the way people think about corporate responsibility and the way we all do business. Growing up in the countryside on farms Alison saw first hand from a young age how important it was for those who live on and work the land to be in harmony with it. And to respect that which gives and provides. Whilst words such as “green” “environment” “sustainable” have grown in popularity and use, Alison believes that this attitude, of respecting that which gives and provides should also be common in tourism. She has a simple approach – and would say that it’s all about being a mindful business. Not about fancy words. This attitude has permeated the business from its earliest days. In 2005 Foot Trails joined the Green Tourism Business Scheme to gain some outside perspective on “being responsible” and built upon the framework of this tourism focused scheme. A Silver award in 2006 (the first in Wiltshire) was followed by the achievement of Gold in 2009 (joint first in Wiltshire) and again in 2012. The acknowledgement of the introduction of over 60 different measures with environmental benefit. In 2008 Foot Trails sought further external accreditation. Foot Trails was the first British travel company to be awarded a “Big Tick for Rural Action” by Business in the Community, a member organisation of the Prince of Wales Charities. A huge honour for a small rural company. The award was given in recognition of the work Foot Trails undertakes to benefit the rural communities and economies in which we work. We achieved re-accreditation in 2009 and 2010. This compared us to other businesses in all sectors and industries, not just tourism and we were honoured to reach the top 5 companies in the UK, standing alongside giants such as Sainsburys and the Co-Op. The team were invited to the Houses of Parliament Select Committee for Corporate Responsibility and to a Downing Street reception with leading business to share good practice. 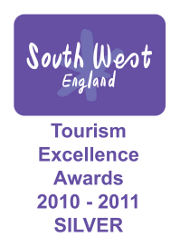 In 2010 and 2011 Foot Trails achieved the silver sustainable tourism award amongst tourism business in South West England – at the South West England Excellence awards. 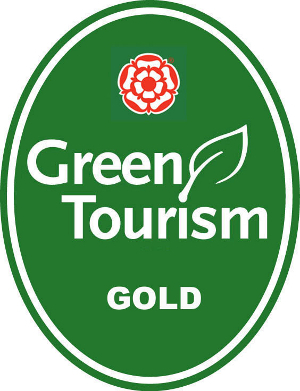 And in 2013 we were hugely honoured to be awarded the the highly respected GoldStar award by Green Tourism Business Scheme for achieving one of the highest gold grading scores in England and Ireland. The award was presented to us by former monk and peace activist Kumar Satish, who once walked a lot further than we did across France! An 8000 mile pilgrimage. When you holiday with Foot Trails you impact positively on rural communities and economies. You are choosing a company that is mindful about what it does and how it operates, including how we work with suppliers and our people. Our key suppliers are small businesses in rural locations. Working together in partnership we can help bring money into rural economies and provide and support local jobs. Foot Trails approach generates greater interest in rural England. It’s history, stories, traditions, industries, food, drink and people. And our trips are helping promote rural England and our traditions across the globe. In practical terms both you and we do many things that make up the 60 measures introduced since we started Foot Trails. • Printing responsibly using waterless printing, recycled paper and a company who produce zero waste. • Working with rural businesses to provide authentic experiences, local jobs and boost the rural economy. • Creating interest and pride in rural England. • Our walk boxes are made of recycled materials. Boxes are filled with wood wool, a natural waste product and sealed with paper tape which is biodegradable.